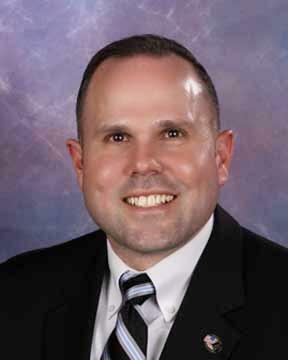 Fair play, transparency, honesty, and integrity regarding the behavior of some who support my opponents in this City Council race has been replaced by smoke and mirrors, attempts to cloud the truth by interjecting opinions, and false statements. These same folks who choose to play dirty politics and wish to continue to hide in the shadows rather than be seen by the light of day are part of the good ole boy system that feels threatened now that fiscal responsibility and transparency has taken hold on their City Council. The tide is changing folks. However, the fight is still not over. That is why I ask each of you to do your research about who has been good stewards of your tax dollars and who would like to continue to spend more of your tax dollars at City Hall if they are elected knowing that by adding more debt to our $88 million dollar debt burden will only result in higher taxes being placed on your shoulders. I know how fragile our economy is right now. I know the numbers and I also know that the only way to return us to economic prosperity is by managing your dollars wisely. The economic success of your City will depend on keeping the right folks in office. The right folks are those who are fiscal conservatives and would manage your tax dollars in the same conservative manner as they manage their own households. That is why I ask you to look at the facts here and my record versus allowing opinion to cloud your judgment and those facts will lead you to one conclusion and one conclusion only…your conclusion will be that I am the best person as your Councilman for Place 2. 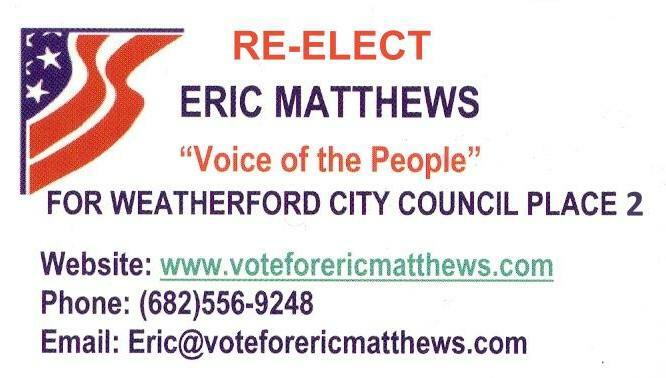 I need you help Weatherford to continue the good work that has already been started. I ask you to go to the polls and cast your vote to Re-Elect me on May 14th as your Councilman for Place 2. Early voting begins May 2nd.